All The Game In The Name Of Ram! Hey Ram! Gandhi Was assassinated! Jai Sree Ram! Babri was demolished! 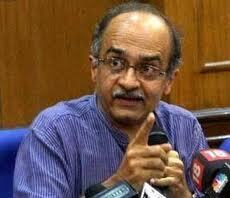 Ram Sena!Prashant Bhushan was attacked! The attackers in all the three incidents were invariably the devotees of Rama. In the first case one devotee of Rama (Godse) killed another devotee of Rama. In the second, the devotees of Rama resorted to this attack for the sake or Rama. In the third case the attackers call themselves Ram Sena, to hit Prashant Bhushan, a close aide of Anna Hazare, a devotee of Rama. With the third event, it has been proven the home grown Hindu fundamentalism is in no way inferior to other forms of fundamentalism of other religions outside the country. These fundamentalists know pretty well, that the majority of Indians oppose acts of this kind. Still they resort to attacks of this nature once in a while. Some outfits of Hindu fundamentalism (like Abhinav Bharath) were accused in Mecca Maszid bombing and in Ajmer Dargah attack in the year 2007. Chidambaram, the Union Minister of Home, once sarcastically called it as ‘Saffron Terrorism’. In order to show the Indian minority communities in bad light and there by mustering the support of majority Hindus, these outfits perform violent tricks. While India is under seize by Islamic Terrorism, this ‘Saffron Terrorism’is adding fuel to the fire. Though BJP and Shiva Sena are the beneficiaries of these acts, they disown these fundamental outfits on record. THESE COWARDS ATTACK WOMEN.THEY R MALE CHAUVINISTS N THINK,THEY R MORAL BRIGADIERS OF SOCIETY.